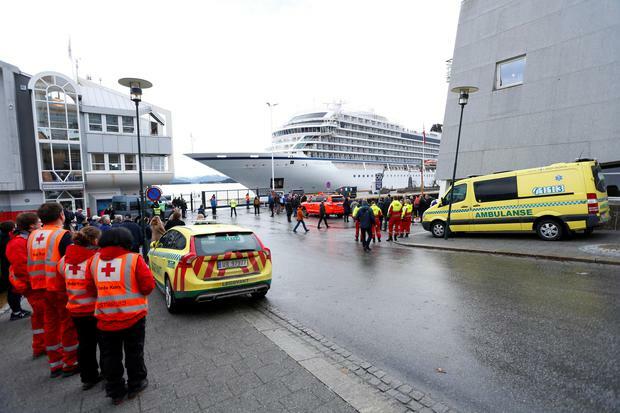 A spokeswoman for Viking Cruises said the ship had docked in the port in the city of Molde, on Norway's west coast, at 4.30pm local time on Sunday, having travelled there under its own power. A statement from the operator thanked the local emergency services "for their support and skill displayed in managing the situation in very challenging weather conditions". It added: "We would also like to thank the local residents who throughout the whole process have been extremely supportive and hospitable." The operator's chairman, Torstein Hagen, told Norway's VG newspaper the events were "some of the worst I have been involved in, but now it looks like it's going well in the end and that we've been lucky". The shipping tycoon, who is one of Norway's richest men, added: "I am very proud of our crew."